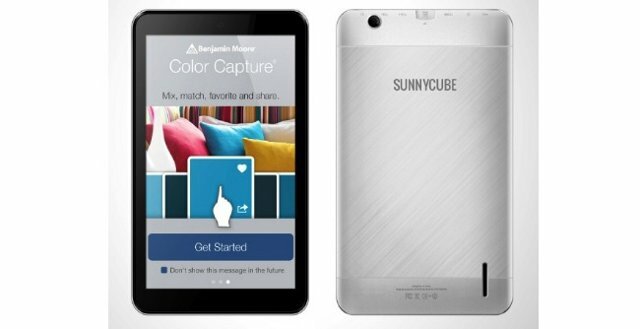 Remember SunnyCube V7 tablet with a dual core Cortex A9 SoC available for just $40 in China? I had a target between $50 to $55 on Aliexpress, but I’ve been explained I may have been too optimistic with shipping fees and the 5% seller fee in Aliexpress platform. Nevertheless, the device, or a similar device, based on WonderMedia WM8880 is now available for $59 including shipping on GeekBuying, which puts it in slightly higher price (~$7 more) than AllWinner A13 tablets, but with much more processing power, and HDMI output. This tablet comes with a charger, a micro USB to USB female adapter, and a user’s manual. The Antutu score in Geekbuying is just 7,000 instead of the 10,000 score found last time on Wondermedia WM8880 reference tablet. I’d assume GeekBuying screenshot is incorrect, because the screen resolution of the device is 800×480, but the Antutu screenshot shows 600×1024, and very low 3D GPU score. I’d expect something around 9,000 to 10,000 for this device. This tablet does not have great specs, but this may just do for your kids, or if you just need a tablet for some basic tasks. What is causing the slowness of this device? The low RAM? Or the Mali GPU … ? What I meant is that it won’t be as fast and nice as latest quad core tablet as with an HD display. The lack of RAM may make it slow when you use an app, and Google Play install an app in the background. It’s also more likely than an app will be terminated when it’s in the background. Mali-400 MP2 GPU should be OK for many games, but possibly not as smooth as Mali-400 MP4 or PowerVR GPU for some higher end games. I had a WM8850-MID tablet (but the battery died after a year) with single core A9 + 512 MB RAM, and I could play games such as Subway Surfer, some 3D racing games smoothly, much smoother than A13 tablets that struggle to play Subway Surfers. WM8880 is even more powerful, so I assume it will be just fine for most tasks. I was half right, as I thought $55 was achievable (maybe soon). Quad core / 2GB tablet for $50? OK no problem… in 2014, announced right here on cnx-software.com via onebir tip. You must be kidding us ;-). A13 crap goes $7.2/1K on aliexpress: http://www.aliexpress.com/item/free-shipping-7inch-Q88-AllWinner-A13-1-0-1-2GHz-DDR3-512M-Tablet-PC-4GB-MID/960201679.html . And one guy with non-zero feedback sells singles at ~$20: http://www.aliexpress.com/item/Cheapest-7-inch-Tablet-PC-Multi-touch-Screen-Android-4-0-ICS-Allwinner-A13-512MB-RAM/670657010.html . 10 people ordered it today (and noone else or before), including me – I hope to buy CNC/3d-printer/laser cutter there one sweet day, so really could use 1st-hand experience with buyer protection on Aliexpress :-D.
Seriously now, you do realize these are scams, don’t you ? The performance is not very good however. My niece has one similar, and some games are pretty slow. It outputs 1080 HDMI, but if the source is not ‘great’ the picture suffers. Its faster than you might think, w/ a Antutu score of 15,600, or ranked about the same as the HTC One X. & moving apps to SD doesn’t work. But it easy to root, & some apps will work great, plus some other apps help its performance. DO *NOT* ‘overload’ one of these, or it gets really slow, hangs, gets even more flakey than usual. Keep at least half, or a little more, of the 4GB free. I’m down to 1.4GB free, & it gets a little more flakey now. There are other minor issues, like most screen protectors don’t seem to fit just right. So far there aren’t any ROMs available, but it looks like some folks are trying to fix the stock ROM. or maybe a higher-priced name-brand next. Hopefully helpful to anyone considering one of these.